You’re looking at a dark chocolate peanut butter cup recipe that is so good you can’t even tell they are a low-carb, sugar-free treat. If you enjoy a low-carb lifestyle and are craving something sweet these chocolate peanut butter cups will cure all. I don’t always eat low-carb and it was hard for me to stop at eating just one of these beauties which are similar to Reece’s Peanut Butter Cups that you can buy at just about every shop. I’m not even a huge peanut butter fan as I didn’t grow up on it like my wife did but when you mix it with chocolate something magical seems to happen. Ya, you know what I mean. My wife and I made these about 3 weeks ago now after she was in serious need of fulfilling her sweet tooth after dinner. Over Christmas we make a chocolate peanut butter ball recipe which is famous with just about anyone we’ve fed them to. We took that concept and created the Dark Chocolate Peanut Butter Cups but we made them in large size muffin liners re-create the Reece’s Peanut Butter Cup. A nice chocolate which you can use is Lindt Dark Chocolate 80% or bitter-sweet dark chocolate squares along with 100% dark chocolate cocoa along with organic coconut oil, butter and erythritol for sweetness. If you prefer to make organic dark chocolate peanut butter cups simply find an organic chocolate that is sugar-free, dark and 80%-100%. Note: What I suggest is to taste the sweetness of the chocolate and peanut butter filling before you create your peanut butter cups. This recipe is sweetened to our liking and yours may differ. Melting this on the stove-top was simple to do and after a sweet taste test we started painting the insides and bottom of each muffin cup liner with chocolate. You can use a spoon for this or a pastry brush if you’d like. I find the spoon quicker plus you can measure out how much chocolate you want in each cup. Once you have the muffin liners painted with chocolate put them in the freezer to harden for about 10 minutes or while you make the peanut butter filling. There’s no method to the creamy peanut butter filling apart from putting it all in a bowl and mixing away. 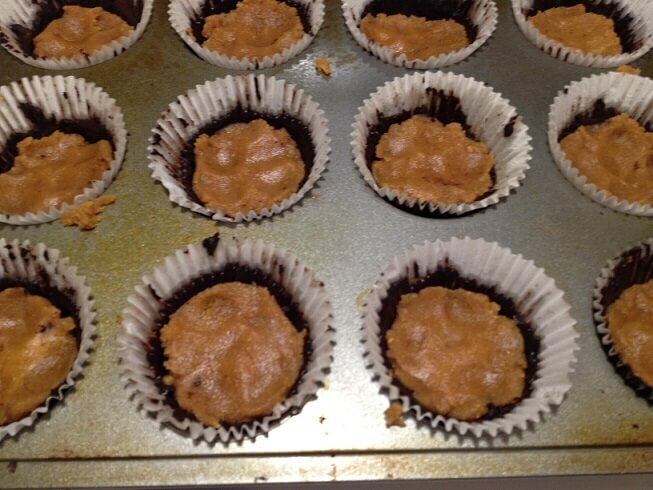 As soon as your peanut butter filling is ready pull out your chocolate-hardened muffin liner cups. Take a tablespoon of the peanut butter filling and flatten inside each chocolate cup just up to the chocolate line around the liner. Once you’ve filled them all with peanut butter take the remaining melted chocolate and pour a teaspoon over each one to cover the peanut butter. You may have to re-heat your chocolate which we normally have to do with the waiting period for freezing the liners. It can be a bit messy and look not so great but when they are done they look and taste fabulous. Put the tray back in the freezer to harden for about an hour, then enjoy. If you want to add the crunch factor you can use a sugar-free natural crunchy peanut butter or add some hemp hearts to the top of each one before you add the final dark chocolate layer. My wife can’t get enough of these dark chocolate peanut butter cups so I’ve made her a batch of 12 for Mother’s Day which I know will get me that happy smile I always enjoy seeing from her. She loves chocolate and just because she no longer eats traditional sweets she still can enjoy her chocolate without the guilt. Not interested in the low-carb sugar-free version of peanut butter cups? If you want to make these using regular peanut butter you can do that as well and add a 1/2 cup of icing sugar to the peanut butter, mix and that will be your filling. You won’t need the almond meal. You can use any type of chocolate you want for melting. If you want to keep it similar to the traditional peanut butter cups go with a nice milk chocolate or semi-sweet chocolate. Again, you won’t need the butter, coconut oil or sweeteners so just eliminate them. You can keep the vanilla extract and pinch of salt as that is needed. 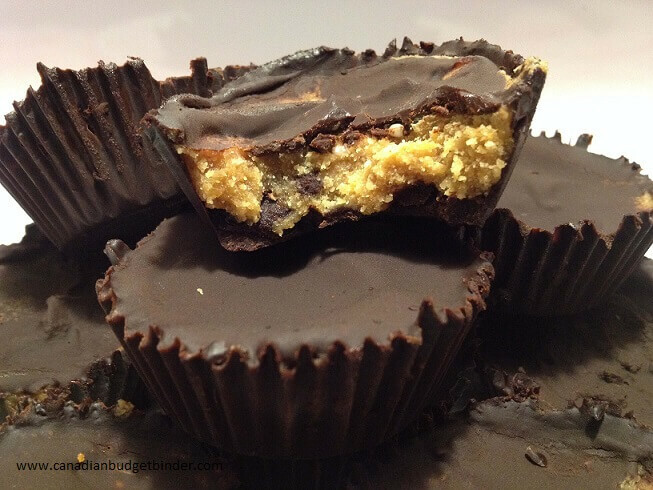 Make your own peanut butter cups and you’ll never go back to buying them again. If you want to cut the carbs further you can eliminate the almond meal 1.60 g and use less chocolate. You can also alter the peanut butter which gives this recipe 24g of carbs. 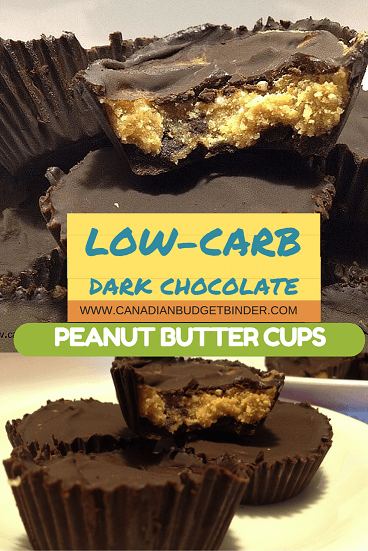 We loves these low-carb, sugar-free dark chocolate peanut butter cups so much that we make them at least once a month to help satisfy our sweet tooth. 1 packet of Splenda or teaspoon of liquid Splenda or sweetener of choice. In a small pot add butter and coconut oil to melt. 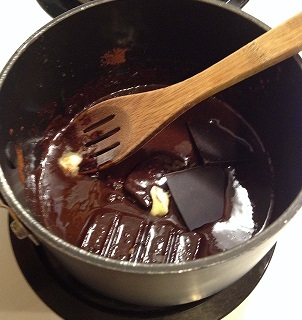 Then add the cocoa, dark chocolate squares, vanilla extract, powdered erythritol and Splenda to combine until melted. 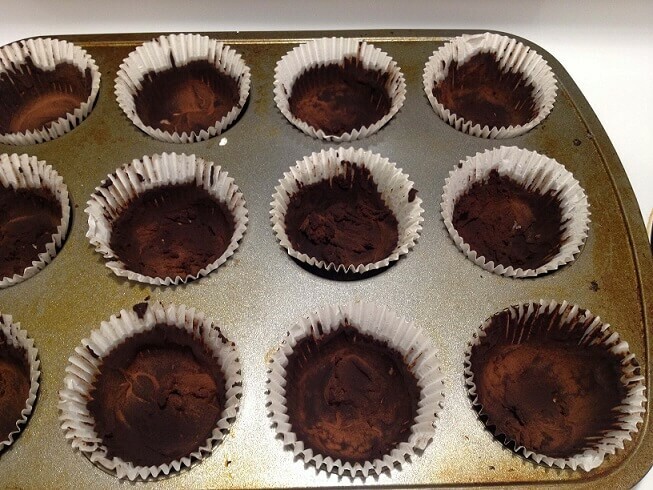 Take 12 muffin liners and with a tablespoon add melted chocolate to the bottom of each muffin liner one at a time and then up the sides but not to the top. I stop mid-way. Once you've completed all 12 freeze for 15 minutes or until hardened. Meanwhile in another microwave safe bowl add your peanut butter and microwave for 25 seconds. Take out and add your almond meal, pinch of salt, vanilla, whipping cream, 1 packet of Splenda or teaspoon of liquid Splenda or sweetener of choice and powdered erythritol. Flatten the peanut butter mixture and add a tiny sprinkle of hemp hearts if you want to add a bit of crunchy texture. If not take another tablespoon of the melted chocolate which you may need to re-heat and spoon it on top of the peanut butter to cover it all. Put the finished peanut butter cups back in the freezer until hardened about an hour is good. 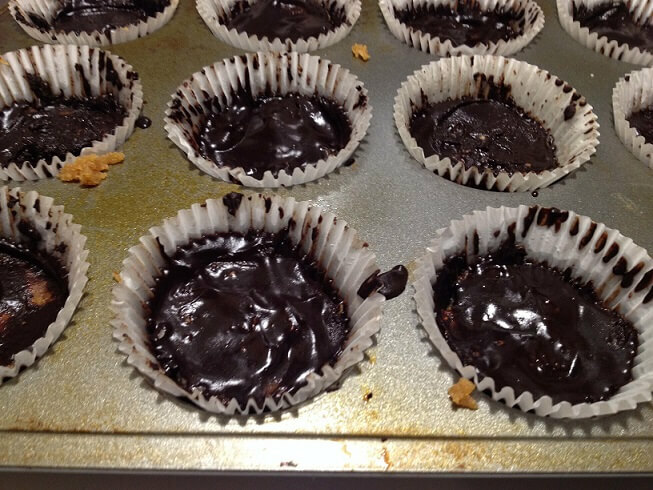 Remove the muffin liners and enjoy your sugar-free, guilt-free, low-carb dark chocolate peanut butter cups. You better hide these dark chocolate peanut butter cups away otherwise you may be tempted to eat more than just one. I know, I’ve done it multiple times. It’s just so hard with chocolate. Do these need to be stored in refrigerator or freezer? Thanks! My wife always likes to store in the freezer. She also says if you can wait a day everything low-carb always tastes better as it has time to settle. I’ve had the store-bought Atkins peanut butter cups before, but these look way better! I will attempt this! Let me know what you think. You can adjust the sweetness as you wish or even leave out bits. When I make reg pb cups I use straight peanut butter and confectioners sugar for the filling and that’s it. I don’t microwave it either. Options are great once you paint the chocolate into the muffin liners. Those look absolutely amazing! I may have to pass this recipe on to my hubs so he can whip some up when we get home. These do look tasty and I don’t even like PB!! Dark chocolate however…………. I’m sure you and your wife know, but for those that don’t, you need to be careful with the artificial sweeteners like Splenda. Besides not being all that good for you they can lead to, shall we say, the scoots if you have too much. Watch that sweet little man of yours around them!!!! Thanks they are good. We don’t use much sweetener in our diet.